Feedback offers animated 3D video of a person’s performance, accompanied by an audio description of the task, and some key measurements shows in simple 2D format. The purpose of the report is to allow personal assessment of easy to understand data by each individual. It enables the test person to view both the measurement details and the real time video of themselves doing the scan. Initial scan results should be given context by seeking advice from a health professional, however over time with experience the Health seeker can visualise and understand the data themselves. In Posture Scan the feedback would contain an audio track with general explanations about the tasks for each exercise and would be automatically shown after a scan. The availability on Posture Scan depends on enabling the feature within settings of Posture Scan and is available to everyone within the organisation. It can be replayed and accessed multiple times on Movement Lab. Since access to Movement Lab is only to analyst within the organisation, to view the Feedback again, only these group of users can have access to Feedback multiple times. By clicking on the screen, the person’s body can be rotated to see most of the 3-D profile of the person from the front, side, overhead and floor views. Simplified 2D illustrations represent key tracking points and any significant measures. 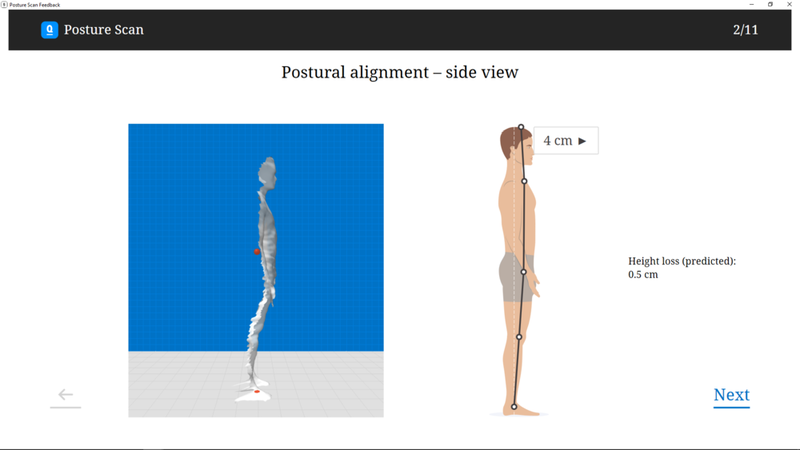 It displays estimates of postural alignment from the side and back, balance, sway patterns, displacements and angles. Please check that there are not obvious anomalies in each test. To progress through the feedback document. Feedback is self paced. Simply press the ‘Next’ button in the bottom right corner of the screen to go forward. Press the arrow in the bottom left of the screen to move backward. Basic descriptions of what to look for on each screen is available on audio. The transcript can be found at the bottom of the page of a summary report. Press the ‘skip’ button to the bottom left of the screen.